Update 11/03/2009: Finished building this wonderful kit, shots of the build can be found here. I was antsy in the house because my EMS package hadn't arrived yet after two weeks, so my wife, the ever loving wife that she is, told me that maybe I should drop by the post office to check if the package was there already, since I was going to run errands anyway. And I was, "You can do that?" So I did and to my surprise it was indeed there already. Yippee! 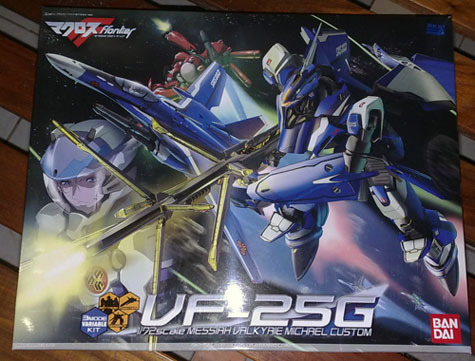 A few weeks back I had placed an order at HLJ for the VF-25G because it was on sale for only Y2,700 or 40% off from the original price. The VF-25G is Michael Braun's custom VF-25 Messiah in sniper configuration as found in the Macross Frontier series. The kit is just your regular VF-25G with sniper rifle, shield and knife. It doesn't come with Super Packs, that has to be bought separately. As I got home the first thing I did was rifle through the manual and check if the parts were complete. Sure enough as stated in the manual it came with the 13 plates, decals, stickers and metal rods. The VF-25G is a snap fit model which doesn't require any paint or glue. For more information as to how the kit parts look like, you can check out its product page at Hobby Search. Reading through the manual really exercised my Japanese because its really rusty. I remember a time when I was gunning for San-kyuu certification and could really read a lot of Japanese kanji, now I can barely remember them. I should really try to study Japanese all over again because it could be good for my career as well as for this site... hahaha, talk about motivation! Why did you study Japanese?, so that I could assemble Plamodels Sir! 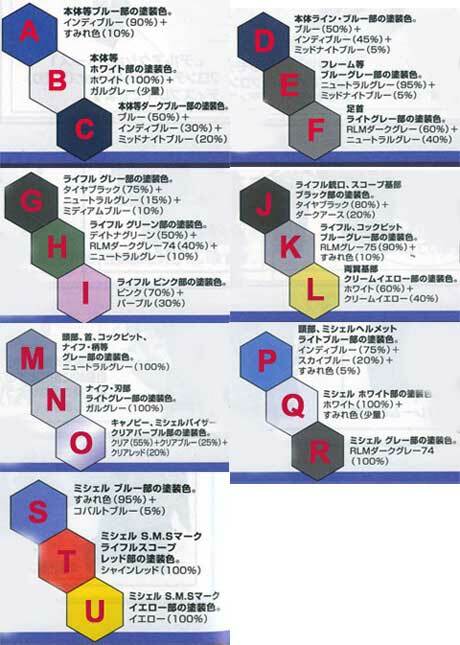 Aniweys, here's some of the stuff I found in the manual that could be interesting. Can't really say that the translation is accurate or the meaning is correct, so kindly use at your own risk. I haven't read a model kit manual in more than a decade. I can't believe how complex and detailed it has become. What surprised me was the Color Guide printed at the back of the manual (along with the guide for installing the decals and stickers). I added letters to the colors so that I could easily enumerate how the color is mixed together and what it is used for. 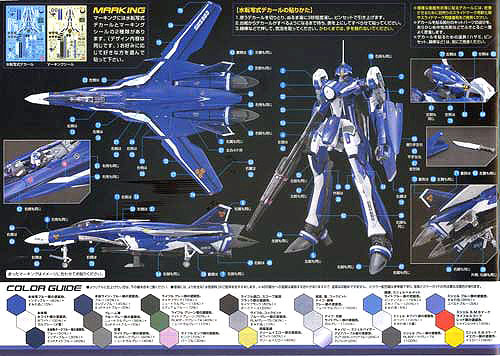 A - Basic blue of the VF-25G, made by 90% Indy Blue and 10% Violet, not sure if this is correct but "Sumire" means violet in Japanese so I'm assuming it is the color violet. B - Basic white of the VF-25G is 100% white with a small pinch of "Gar Grey", they probably mean "Dull Grey"
J - The dark color of the sniper rifle, sniper scope and other black parts is made with 80% Tire black and 20% Dark Ash. K -The blue gray found in the rifle and VF-25G's cockpit is made by mixing 90% RLM Gray-75 with 10% violet color. M - the gray found in the cockpit, knife handle, head is actually 100% neutral gray! O - The canopy and Michael's Visor is colored clear purple. This is made by mixing 55% clear, 25% clear blue and 20% clear red. P - Michael's helmet,　head, has a light blue color that is made by mixing 75% Indy Blue, 20% Sky Blue and 5% violet. U - The yellow found in Michael's SMS mark is plain old yellow. You don't really need to paint the kit but the guide above is incase you want to. Thought I'd show some pages of the manual. 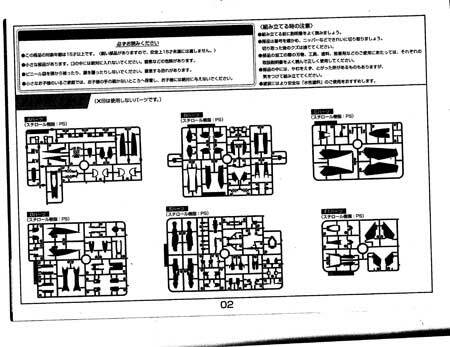 Page 2-3 is basic fare, shows the plate parts included in the kit along with the count for the decals, stickers and steel rods, and other notices (e.g. age restriction etc). On page 2 and 3, where the plates are shown, the parts marked "X" aren't needed in this kit. Each plate comes with a letter code and above the picture of that plate is its letter code along with the material that it is made of. Then page 4 consists of stuff you should know about before beginning the assembly. Like, the Tools you should have. 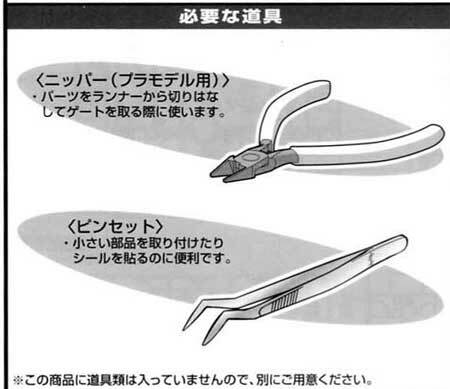 The first is a pair of modelling nippers which is used to cut the piece off of the plates, the second is a Pin Set which is used for the decals and small parts of the model. There is a little tutorial on how to find the parts. The manual will always refer to the part by its Letter - Number code. The letter means which Plate it is on while the number is the part number on the plate. To find the Plate letter just look for it on top of the plate while the number will be beside the part. 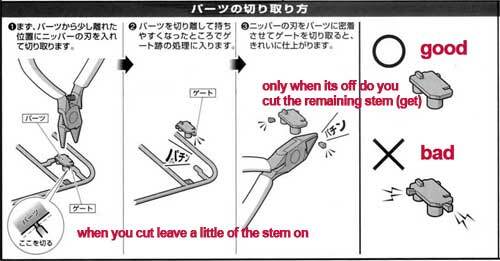 Of course its best to also verify that the part you are cutting off is actually the same as that being referenced in the manual. Leaving some stems on is sometimes good when you are planning to paint the kit. So that your tweezers have something to hold on to. Update: my mistake, the stem is actually called "Gate" and not "get". Then there is the thing with the "double quote" found on the item being assembled in the manual. It points out to you that you should watch out for the position of the part during assembly and verify its orientation with the other parts in the picture with it. Often times it tells you to cut the part cleanly from the stems, most likely because the part in question will be a moving part. Another nifty feature of the manual is a frame that shows some plates at the beginning of each section of assembly of the model. This will guide the assembler to the plates that will be used during this stage of build so that he/she can easily find the part being referenced. Just so you won't get confused also, the decal sheet is the one on the left with the blue background, while the stickers are the one on the right. Basically that's it for now. I'm looking forward to assembling this kit, but I probably won't start till I have fully understood the manual already. Most likely I won't color it either, then again I might change my mind. Will post again here for updates on this project. 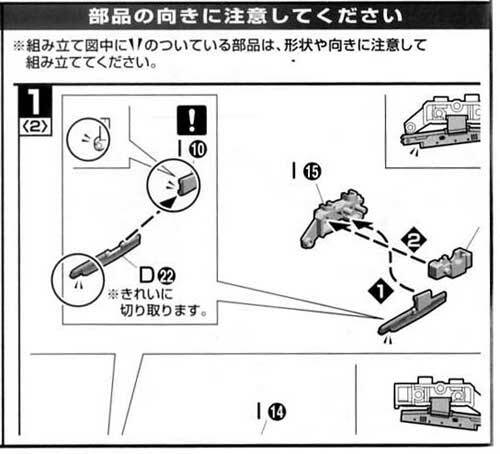 Update: This might turn out to be a full blown English translation of the VF-25G Assembly manual. Check out for new developments here.